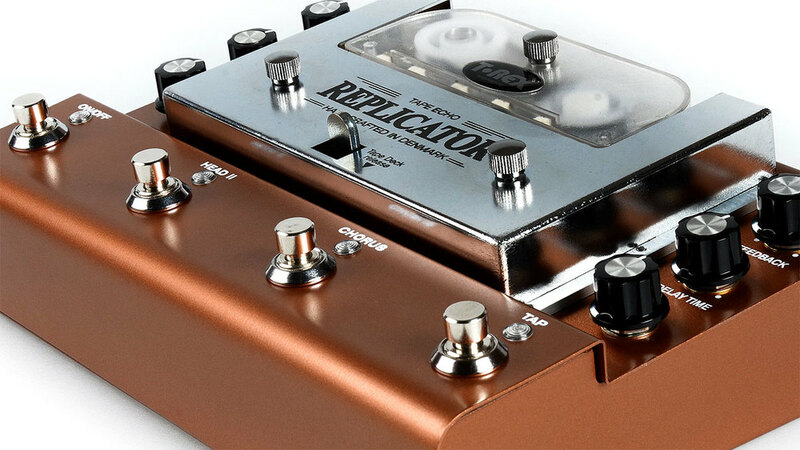 T-Rex are nearly ready to release a real tape echo - The Replicator - that video is a sneak peak. It has a cartridge (new ones will cost 20 euro). Tap tempo. Oh wow - supports two expression pedals for speed and feedback. Has Chorus, Boost, Wet-only signal option. Oh damn - I just heard the bit where they said it was going to retail for about 800 euro. Sounds awesome but it doesn't look beerproof. I love tape echos. More options in the market the better. Hmm...not quite beerproof, expensive, requires occasional tape replacement...but the same can be said of any tape delay ever really. I might as well grumble that valve amps are heavy, expensive and need valves replacing. That never stopped me using those either. I don't even care that it isn't stereo. This is basically what I've wanted someone to produce for years. And yeah - the price tag is steep, but this is the first run. I wouldn't be surprised if they find a way to shave a few euros off that in the coming years. Even so: assuming you can find an original Space Echo or Echoplex on sale in that price bracket, they don't have tap tempo or expression inputs. This could be a very cool thing indeed. I can't ever imagine me buying one of these (even if they were considerably cheaper than 800 Euros) but part of me loves the fact that someone has made this. Very cool and in line with the stuff behind other T-Rex products, Lars and the Danes have really thought the features of this one out for a comprehensive unit with so much stuff that people can use. And it's a modern analog tape machine that doesn't come with a life-supply of condescending customer service, which may be one of its best features. I think this thing looks amazing. It's not something I'd ever buy unless I had money absolutely burning a hole in my pocket. But I think it's really cool. Looks like a very robust idea having the changeable cartridges too. I played one of these this weekend and it was insane. Too good, reminded me of my friends old Echoplex and the Roland space-echos that I've tried at music stores. It sounds so good, but there are a lot of controls on it, so once you get past the learning curve, you have the best modern production delay pedal out there.